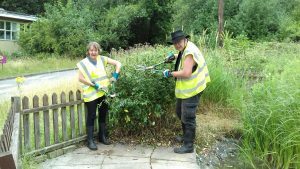 This group was formed in 2016 and every month, continues to support the activities of the Welsh Harp Environmental Education Centre. During this event, you will learn some practical conservation techniques to manage the habitats in the area and all activities focus on improving the natural habitat of the 15 acre woodland for biodiversity and ensuring that the outdoor teaching spaces are safe and exciting for the thousands of school children that attend the centre each year. At this event we will be re-lining the existing pond that we use for pond dipping for school groups so we need all hands on deck to complete this important task! Previous activities have included clearing glades (open areas within a woodland) and pathways which were choked with ivy and bramble, clearing our Forest School Zone to make room for shelter building and fire lighting activities, moving logs and branches around the site for children’s activities and teaching spaces, pond clearance, and there are many more similar activities to come. All welcome! Under 16’s need to be accompanied by a responsible adult, each individual child under 11 years old will need an adult with them at all times. Tea, coffee and snacks will be provided. Please meet inside the education centre. Hope to see you there to continue this amazing work!